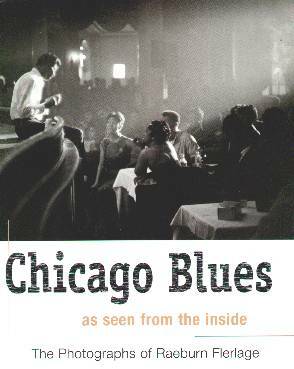 "The Blues" is such an important part of American music and in this book we are able to get a wonderful glimpse into the 60s in Chicago, when people like Memphis Slim, Magic Sam, Howlin' Wolf, and Muddy Waters, among others, were doin' their thang. This collection of photographs by Raeburn Flerlage is fascinating as is his story at the beginning of the book. He tells the tale of how he got into photography and all the jobs he had before he got to where he eventually did, and how he naturally integrated into the black community on the South Side of Chicago at that time. And, how the "largeness of soul" of the people touched him so much. Becoming a photographer came late to Flerlage as he had many varying jobs beforehand, like radio announcer, record salesman, folk music and blues lecturer, and he wrote articles and press releases all before landing his first professional photographic assignment at age 44, in 1959. His pictures in this collection were taken in nightclubs, basements, and in the homes of some of the artists. My favorite photographs are of Jackie Wilson on pages 140/141, Elizabeth Cotton on page 100, and my best, the one on page 63. Conclusion - A Blues collector's dream and great for early Blues and Jazz enthusiasts.